Spotted sunfish are olive-green to brown in color, with black or reddish spots on the base of each scale forming rows of dots on its sides. The preferred habitat is slow-moving, heavily vegetated streams and rivers with limestone, sand, or gravel substrates. A nest-builder that tends to be more solitary than other members of the sunfish family. Males are very aggressive and antagonistic toward other fish in their nesting area. They generally feed on the bottom, but will rise to the surface to feed. The bulk of their diet consists of a variety of plants and animals that are usually associated with aquatic vegetation, brush, or rubble. 0.83 lbs. Big Catch: 8 inches or 0.50 lbs. 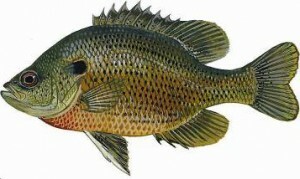 Because of its small size spotted sunfish have limited food value, but it is a feisty panfish.